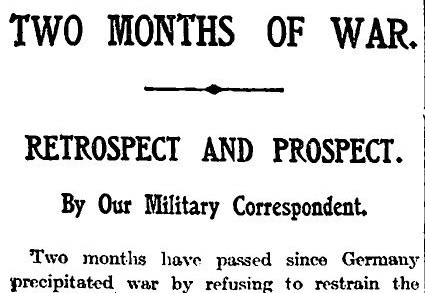 The story of the First World War so far: Germany pushed the bulk of its army through Belgium. The French, along with the tiny British army were unable to hold them and retreated. At the Marne the Germans were stopped and themselves began to retreat. At the Aisne they stopped retreating, dug in and trench warfare began. People are beginning to realise it’s going to be a long war. However much we may hope to bend back the German right and relieve Antwerp [they didn’t]; whatever confidence we may entertain that the shock of the Russian masses in the East may soon prove decisive [it didn’t], we must not entertain the slightest illusion regarding the hard and trying conditions which await all the Allies in their future operations against a Germany reduced to the defensive. Germany is still united and her resources are great. All her men are in arms and all her arsenals are working at full presssure. Her unbeaten fleet and flotillas will strike when their hour comes, and probably in cooperation with her Army. The line of the Aisne, even when forced, may prove only one of many similar lines which are being prepared to the rear of it… and it may take long, very long, for the Allies to compel Germany to experience the sense of her weakness. The writer, himself is worth a mention. He is The Times’s Military Correspondent, a chap by the name of Charles à Court Repington. A talented officer with a bright future, he was chucked out of the army for conducting an affair with a married woman. The army’s loss was The Times’s gain. While no one can predict the future with perfect clarity, Repington did a pretty good job of it as he does above. In 1913, he predicted that Germany’s main thrust would come through Belgium. The French high command did not work that out until late August 1914 when it was almost too late. 1a.m. The night passed quite quietly. About 1 a.m. the Brigadier came up & talked over the situation. He agreed that it was quite impossible to push on until Hill 90 had been taken by the 56th Divn & that all we could do was to remain on the defensive. Any advance up the valley was sheer madness until the Machine Guns on HILL 90 which enfiladed the whole valley had been put out of action. 4.30a.m. The attached orders arrived and in spite of all protests we were ordered to carry them out. There was no time to copy them out & the originals had to be sent up to the forward Coys. B & C Companies supported by the 8th R.B. were to advance up the valley & to try & push on to WANCOURT. The 56th Division never left their trenches or made any attempt to take HILL 90. B Coy under WHITLEY made a most gallant attempt to push forward but from the start it was an impossible task & the Staff who had ordered the attack, if they had ever come near enough to have looked at the ground would have realized it too & would never have ordered the attack. WHITLEY was alas killed, gallant soldier that he was, & his body was found nearest to the German wire which was totally uncut. The artillery preparation which had been ordered in a great hurry never materialised – in fact the orders in many cases never arrived in time & the whole show was a complete failure from want of preparation & organisation on the part of the staff. The rest of the day was spent in our original positions & towards evening heavy snowstorms set in & before long there were two inches of snow on the ground. It was impossible to get in the wounded until after dark so that their sufferings were very much aggravated by the cold. That night we had were relieved by the 8th K.R.R. & moved back to the old COJEUL SWITCH line, where a bitterly cold night was spent in the open, without any dugouts & with fresh snow showers all night. 12th April 1917. The 12th was spent in these trenches & the 8th K.R.R. & 8th R.B. occupied WANCOURT without a casualty as HILL 90 had been evacuated during the night. The whole Division was relieved by the 50th Divn & the Battn marched back to ARRAS. It was an awful march in the dark – the mud was very deep & men had to be dug out of it at times by 2a.m. we reached the town & went into billets. Arras, Allenby. And yet compare that with the Battle of Amiens. Or indeed Vimy Ridge the month before. The German plan to attack through Belgium was not much of a secret. Kaiser Wilhelm himself practically revealed to King Albert of Belgium during a state visit. Willy insisted that perfidious France was plotting war, but would be crushed by the furor Teutonicus. And Belgium, he warned, had better cooperate with Germany or be destroyed. The French high command was aware of the German plan, but dismissed it. They persuaded themselves that the superior élan of the French army would overcome German defenses in Alsace-Lorraine, and that German forces marching through Belgium would all be cut off and destroyed. The farther the Germans went into Belgium, the better for France, they said. Is there an open site to find these old Times articles you’re reading? @Alsadius Not that I know of. I am able to do this through my local library. Maybe yours does the same. I also believe Gale Group offer a subscription service. I make my standard comment. There is a massive difference between siding with the enemy (in the First World War and other wars) and the revolting creature-in-Kent does (with his lies about how the war was not the fault of the German elite – and how it was “none of our business” that they were planning to take over northern Europe and destroy this country) and attacking the TACTICS used in the First World War. It is not unpatriotic to attack the tactics of Haig and co (for example lying to the two divisions on the second day of the Battle of Loos – sending almost ten thousand men to certain death for nothing) – on the contrary it is highly patriotic to attack their tactics (and dishonourable moral conduct – such as lying to the officers of those two divisions). It is well that war is so terrible – otherwise we would grow too fond of it. @Paul Marks. This is not really the place for a discussion of Haig. However, if you wish to be taken seriously you are going to have to come up with a source. Neither of the Haig biographies in my possession support your allegation. … Or indeed Vimy Ridge the month before. As a Canadian, proud of my nation’s feats of arms, I must point out that the Canadian Corp was still securing the area around Vimy ridge on April 11, 1917. The attack commenced on the morning of the 9th of April, also in a snow storm.